All your Windows Server 2008 R2 questions answered—on the spot! 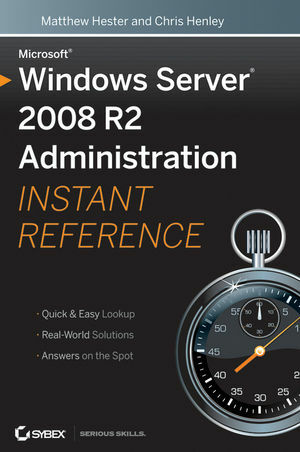 Get up to speed on the new features of Windows Server 2008 R2 with this indispensableguide. Designed for busy IT professionals, it's the perfect go-to resource for quick answers and real-world solutions as you administer the new server OS. You'll find easy-to-read lists, quick-reference tables, helpful thumb tabs, and much more in a handy, compact format that puts the information you need at your fingertips. Matthew Hester, IT Professional Evangelist for Microsoft, has more than a decade of experience with Microsoft core infrastructures products such as Windows, Active Directory, Exchange, and others. He is a contributor to TechNet Magazine. Chris Henley, IT Professional Evangelist for Microsoft, has worked in IT for more than 15 years. Chris specializes in client and server technologies. 1 Getting Started with Windows Server 2008 R2. 2 Add Server Roles and Functionality. 3 Automating Administrative Tasks with Windows Server 2008 R2. 4 User and Group Maintenance. 5 Directory Management and Replication. 6 Maintaining and Controlling the Centralized Desktop. 7 Folder Security, Access and Replication. 9 Disk Management and Storage. 10 Web Server and Maintenance. 13 Managing Server Remote Access. 14 Maintaining Your Virtual Servers. 15 Performance Tuning and Monitoring. 16 Keeping Your Servers Up to Date.